Ampthill Town had no game on Saturday but have two games in four days this week as they look to continue their impressive recent run of form. 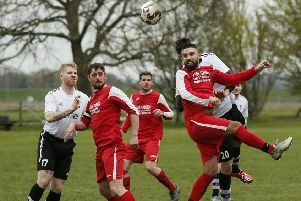 They host Hatfield Town on Saturday and will be bidding to go through the whole of October unbeaten –with their unbeaten sequence now standing at seven games in league and cup. Town have put in some good performances in October, notably against Langford and Risborough, and they will be looking to end the month on a high note with a success against Hatfield. On Tuesday, Ampthill open a busy November schedule with a home fixture in the Challenge Trophy against fellow SSML Division One side Southall. Town beat Tring Corinthians on penalties in the last round and will be keen to make progress into the third round. Ampthill are in cup action again on Saturday week when they go to Pavenham in the Bedfordshire Senior Trophy with a 2pm kick-off.